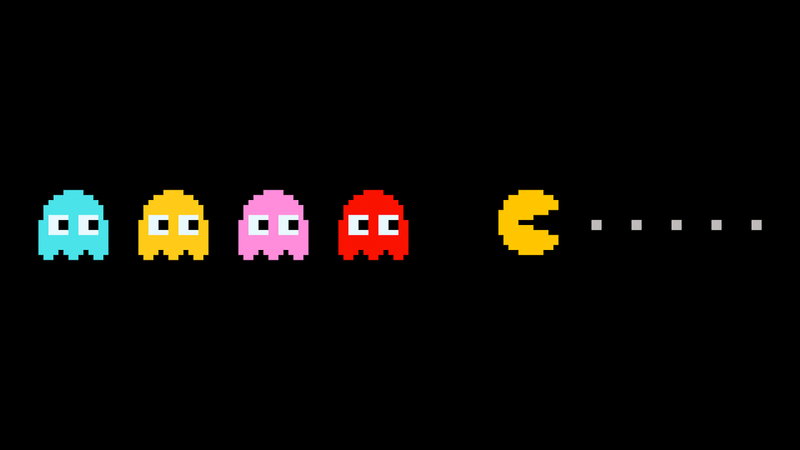 Are We Ever Too Old For Video Games? I remember it clearly. It was 2001. I was on Spring Break. Home alone in the house I’d bought six months prior, and I was bored. The 1982 Panasonic VCR I took from my parent’s house wasn’t working very well anymore. It was time to finally upgrade to a DVD player. I’d recently heard the new gaming system from Sony was also a DVD player. I’d been playing the Sony PlayStation for about 5 or 6 years now. This seemed like a perfect opportunity. Get a new video gaming system and a DVD player in one shot. So off I went to University Park Mall to a store then called Electronics Boutique. I apprehensively approached the counter, told the sales clerk what I wanted, and then shared with him my somewhat-embarrassment for buying a video game system at age 25. He instantly reassured me that folks much older than me still bought video games, and then said, “If guys your age stop playing video games, we’re all in trouble.” Well, last summer I bought an Xbox One. I’ll be 42 in April. I guess the guy at Electronics Boutique had a point! 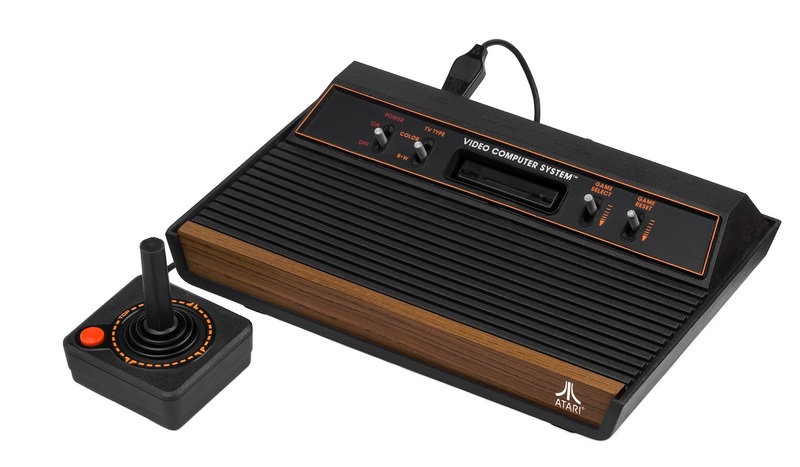 When I was a very young boy my brothers got an Atari 2600. If you’re my age or older, you should recognize that image. In the early 80s there was one in almost every home. The graphics were crude. The sound effects were worse. Yet fortunately, the games were fun. It turned into a craze. The Atari was a huge deal. The Nintendo Entertainment System. This was the ultimate game-changer. I’ll never forget the first time I saw Super Mario Bros. Unlike the Atari characters, which were basically square faceless heads on rectangular bodies, Mario looked like a person. He had a face. Hell, he had a mustache! The graphics were like nothing we’d ever seen before. The music and sound effects were amazing. The game-play was out of this world! 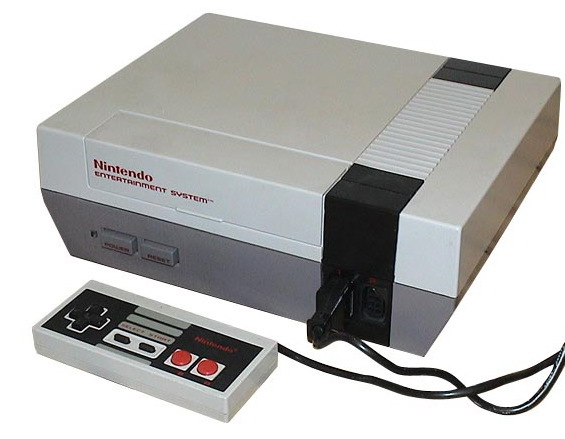 Before long, much like Atari had years earlier, the “NES” became seemingly as commonplace in homes as the television. Prior to the Nintendo, kids in the neighborhood had all kinds of different systems. In addition to the Atari 2600, one kid had an Intellivision, another a Coleco Vision, another The Odyssey, the Commodore 64, the Texas Instruments system, the Atari 5200, etc. Although it was cool to go to different homes and play different systems, the kid who owned that system naturally kicked every one’s butts at his games. When the Nintendo exploded in popularity, eventually all my friends had one. This was great. Most of us played the same games. We now competed on an equal playing field. Granted, being outdoors playing baseball, basketball, toy guns or whatever always took precedent over video game playing. But once we had our fill of outdoor activity, we loved heading to one of our respective basements, armed with Popsicles, ready for Nintendo battles. Some of my fondest childhood memories are summertime sleepovers playing Nintendo into the wee hours of the night with friends. Eventually we upgraded with the times. For some of us that meant the Super Nintendo or the Sega Genesis. Next came the Sony PlayStation and then the aforementioned PlayStation 2. 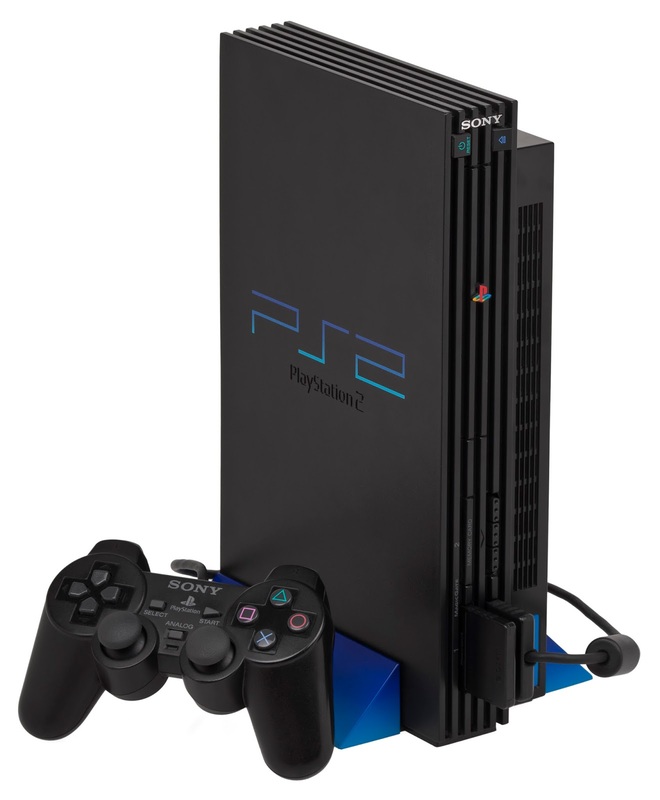 I still contend the PlayStation 2 was the finest system ever produced. It did it all. It was the best gaming system of its time. It played DVDs. It played CDs. Additionally, it was the first and still only system ever to feature complete backward compatibility. This meant, it could play all your PlayStation One games as well. Modern systems feature limited backward compatibility, but for some reason not full. All my PS1 games worked on my PS2. This was huge for parents. It meant all the money they spent on PS1 games for their kids didn’t go to waste once they bought a PS2 for them. Later on I’d buy my wife a Nintendo Wii, myself a PlayStation 3, and as I mentioned, last year I upgraded to an Xbox One. So this leads me back to my initial question: Are we ever too old for video games? I thought about this question and then realized something. We didn’t have a home computer until I was in high school. The Internet was of no purposeful use until I was on my way out of college. (Believe me, I often remind my students how fortunate they are to have the Internet. What now takes them five minutes on a smart phone took me five hours in the I.U. library looking for books, encyclopedias, and published articles on microfiche! Yeah, that was the sound of me throwing up on my feet, but back to the point) I didn’t even have a cell phone until I was a couple years out of college. Yet nearly as far back as I can remember watching television, we had a video game system. Its always been a part of my life. Granted, my level and time of game playing has changed over the years. In the Nintendo days my friends and I would play anything and everything we could get our hands on. The past 20 years I just play sports games, primarily football, basketball, and racing games. I couldn’t tell you the last time I killed a day playing games, but I still try to carve out 30 or 45 minutes as often as I can to take on a game of Madden football or NBA 2K before I go to bed. I find it relaxing. I still find it fun. Perhaps I’m just clinging on to the last bastion of my childhood. Who knows? Eventually my boys will likely find interest in video games on some level. I hope I’m right there playing along side them. I hope I never get too old for video games!!!!!!! 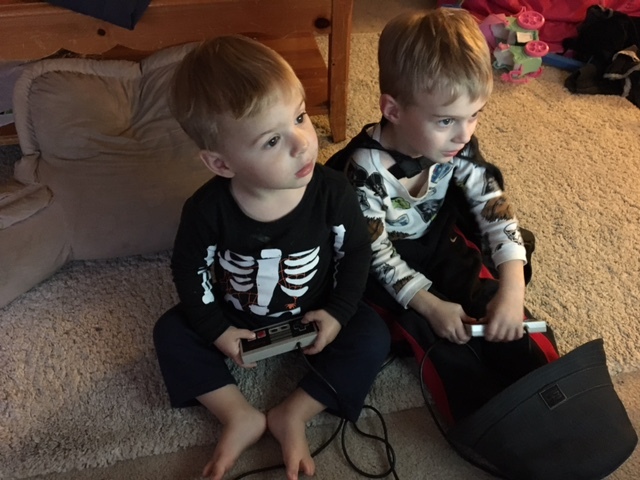 Leo & Giovanni pretending to play Nintendo!!! Thanks for reading and I appreciate the comments. Good call on the Lego games. I will try it!